Yep, We're Hooked on Bonefish Grill's Hooked on Tuesday Menu! Disclosure: I received a gift card to try the Hooked on Tuesday menu at Bonefish Grill in exchange for this review. No demands were made on what the review would contain and all opinions are 100% my own. 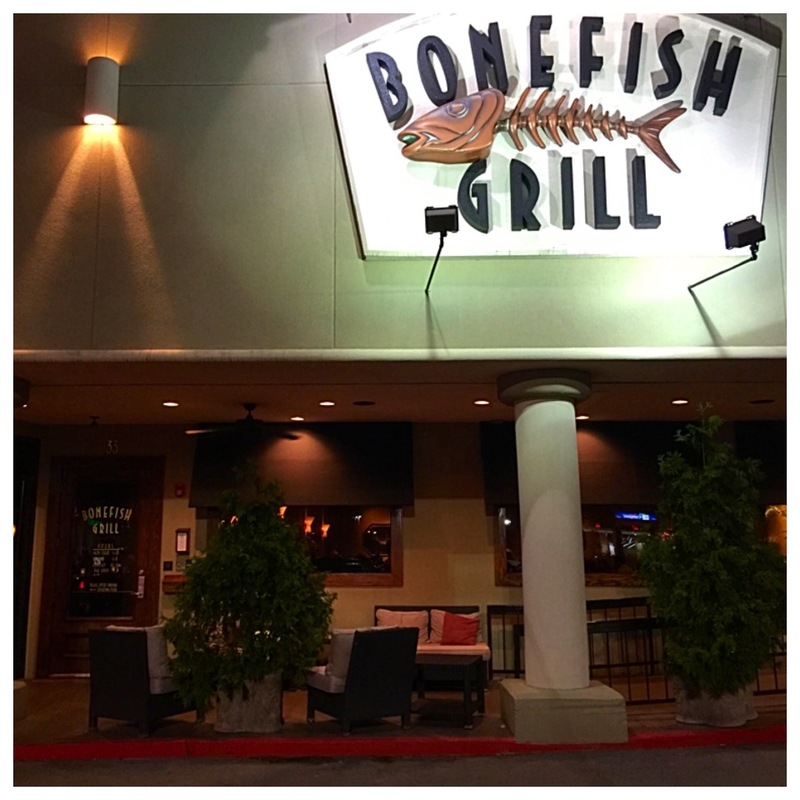 When Bonefish Grill contacted me about trying out their new Hooked on Tuesday menu, I was only too happy to cooperate. 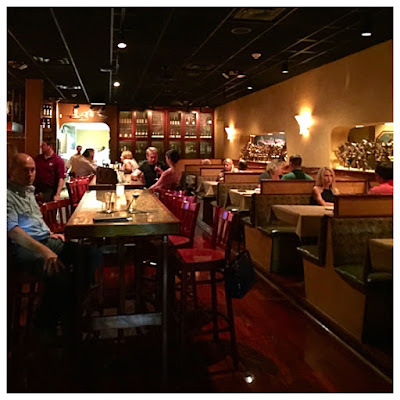 Even though I usually try to keep my reviews to smaller, one of a kind restaurants, Bonefish is a chain with which I am happy to associate. Since 2009, when the restaurant first opened in Huntsville, it has been one of our favorite places to dine. 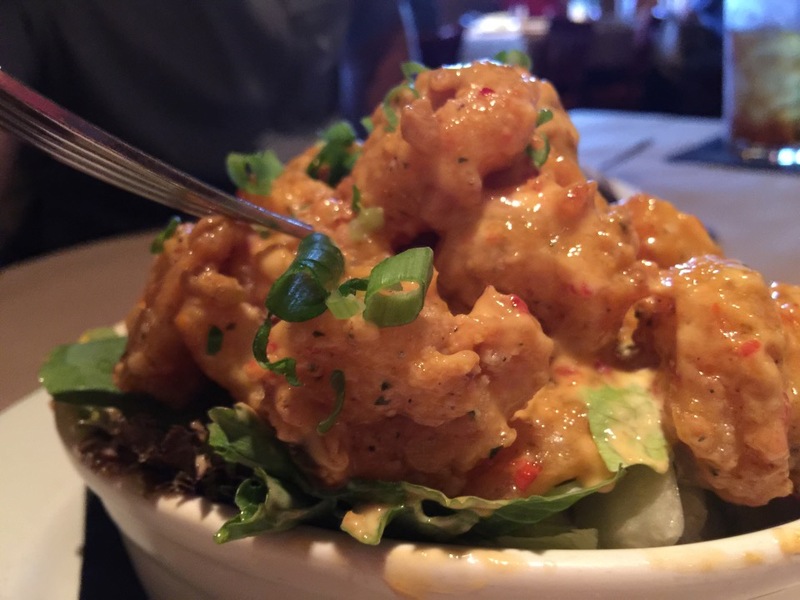 Honestly, we really were hooked the first time we bit into Bang Bang Shrimp all those years ago. Now it seems like every restaurant has a version of Bang Bang Shrimp on the menu, but I always think of the appetizer at Bonefish as the original. There were four of us ready to check out the new menu, Scott, JD, Rob and me. We pulled into the parking lot and headed through Bonefish's revolving door thinking we would have the place pretty much to ourselves, since it was a rainy Tuesday night, after all. We could not have been more wrong! The place was packed! I was really happy we had reservations. The new Hooked on Tuesday menu must be having the desired effect! Since we were a few minutes early, our hostess gave us a buzzer and we headed out to the sidewalk to wait. We didn't have to wait long, though, before our buzzer beckoned us to head on in, where we were quickly seated. Our waiter promptly showed up to take our drink orders and the boys wasted no time in ordering an appetizer of...you guessed it...Bang Bang Shrimp. 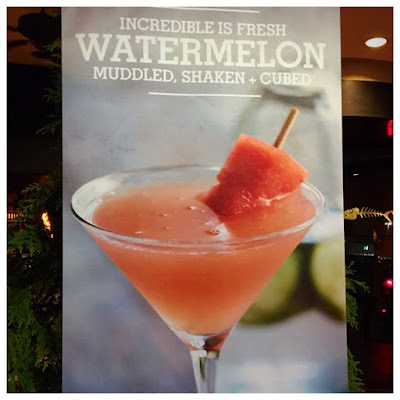 I had seen a large banner outside for a watermelon martini. It looked so pretty and delicious, I could not resist checking it out for real. Good call, because it was just as pretty, and tasty, in person. 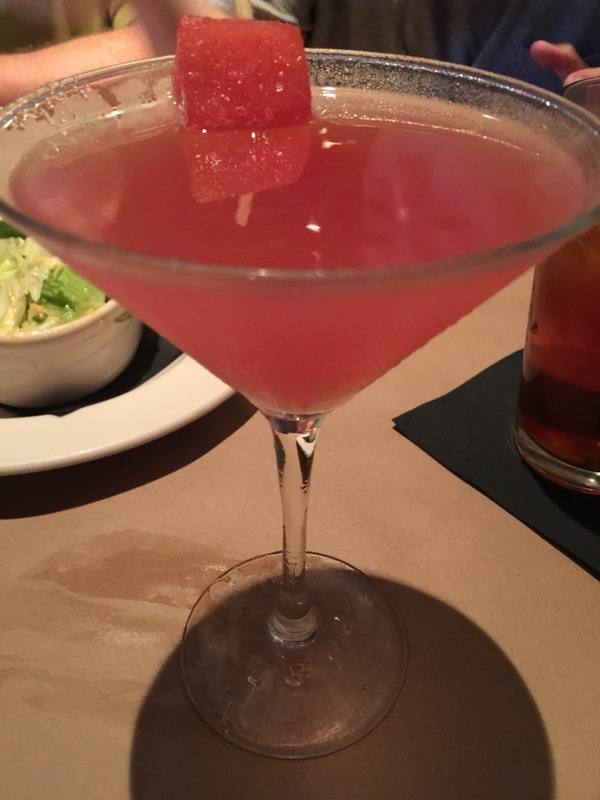 The fresh Watermelon Icicle Aphrodisiac Martini was a cool concoction of hand muddled watermelon, fresh homemade sour, a house-made cucumber vodka infusion and watermelon ice cubes. It was refreshing. The Hooked on Tuesday menu consists of three courses: salad, entree and dessert. 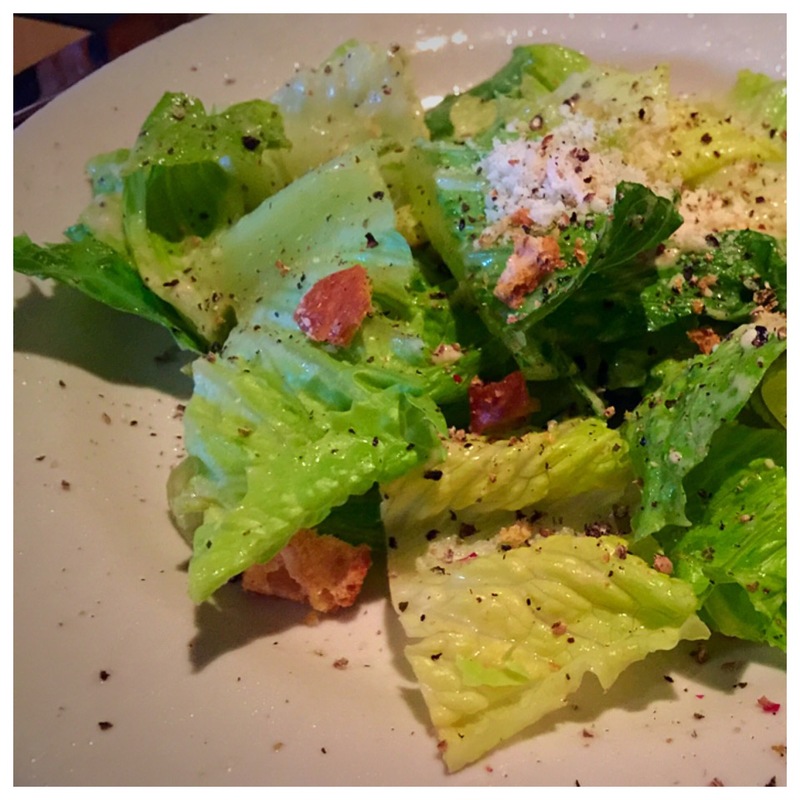 There are two choices for salad, either the Bonefish house salad or a Caesar salad. Scott and I got house salads and the boys both got Caesar salads. The Bonefish house salad is one of my favorite salads, so much so that I used it as my inspiration for my Palm Beach Salad recipe. 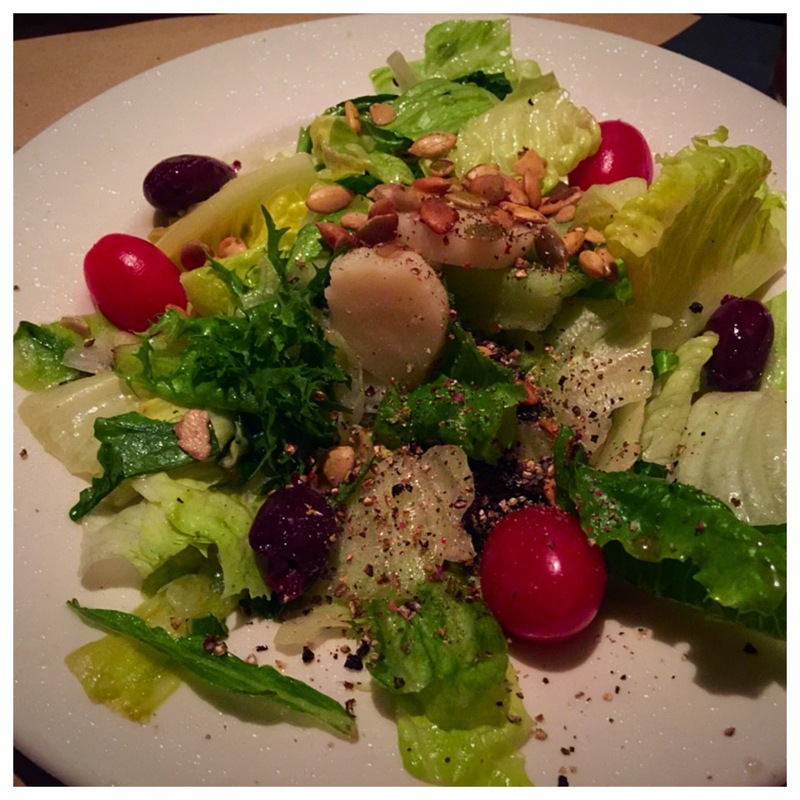 I love the pine nuts, crunchy romaine and hearts of palm, drizzled with the sweet, citrusy dressing. The boys loved their Caesar salads, too. 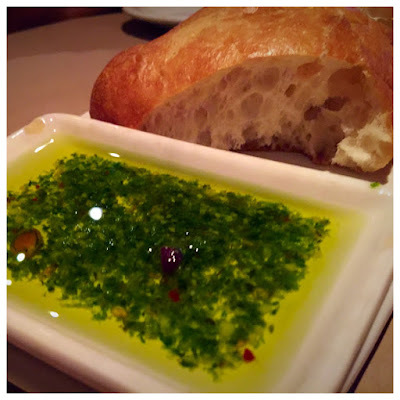 Along with our salads, our server (who was wonderful, by the way) brought out a crusty loaf of bread with herby olive oil for dipping. We enjoyed it so much, he had to bring out a second loaf! The entrees on the Hooked on Tuesday menu are divided into three price points. Coming in at $14.90 are a 6 oz. 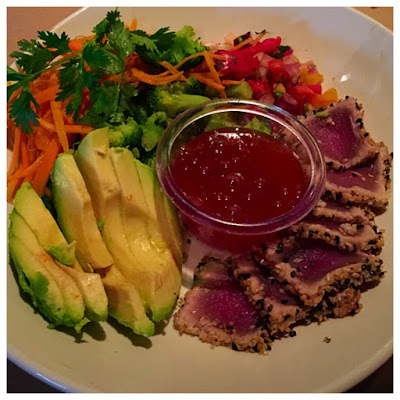 Atlantic Salmon, Spicy Tuna Bowl and the 6 oz. Angler's Steak. JD chose the Spicy Tuna Bowl from this group. He asked for the rice in the bowl to be omitted, which our server was more than happy to accommodate. I am always amazed when JD orders a bowl of anything, because he is one of those people who eats one item on his plate at a time. I wasn't sure how much he was going to like a bowl of mixed up ingredients, but I worried for no reason. The bowl came out with all the components separate and ready for the diner to mix, so it was perfect for JD. He ate each component separately and loved it. He enjoyed dipping the spicy tuna into the sweet passion fruit salsa, too. Ahi Tuna Steak, Cold Water Lobster Tail and Fontina Pork Chop were the offerings at the next price point of $17.90. Rob chose the lobster tail. His colorful plate came with au gratin potatoes, mixed grilled vegetables dusted with parmesan cheese, a grilled lemon and butter in a tiny little flamed sauce warmer. Rob's said he really liked his beautiful dinner. 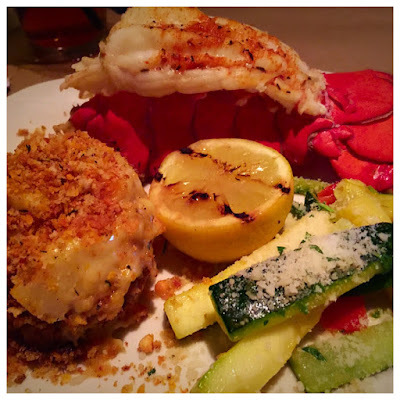 The final price category included Sea Scallops + Shrimp, Pecan Parmesan Crusted Rainbow Trout and a 6 oz. Filet Mignon. Scott and I both made our selections from this group. Scott chose the filet and I had the scallops and shrimp. I was trying to decide which of Bonefish's delicious sauces to pair with my shellfish and was thinking of either mango salsa or lime tomato garlic. I asked our server and he recommended the Pan Asian sauce, so I went with his suggestion. It was a very good call! I love the slightly sweet sauce with the salty seafood. Our server was also super accommodating when I requested grilled asparagus rather than the mixed vegetables. Additionally, my dinner came with a side of creamy mashed potatoes. I loved everything on my plate, but by this point I was already so stuffed there was no way I could eat all this food. Not to worry! JD polished off his tuna bowl and my plate as well! Scott said his filet was delicious. 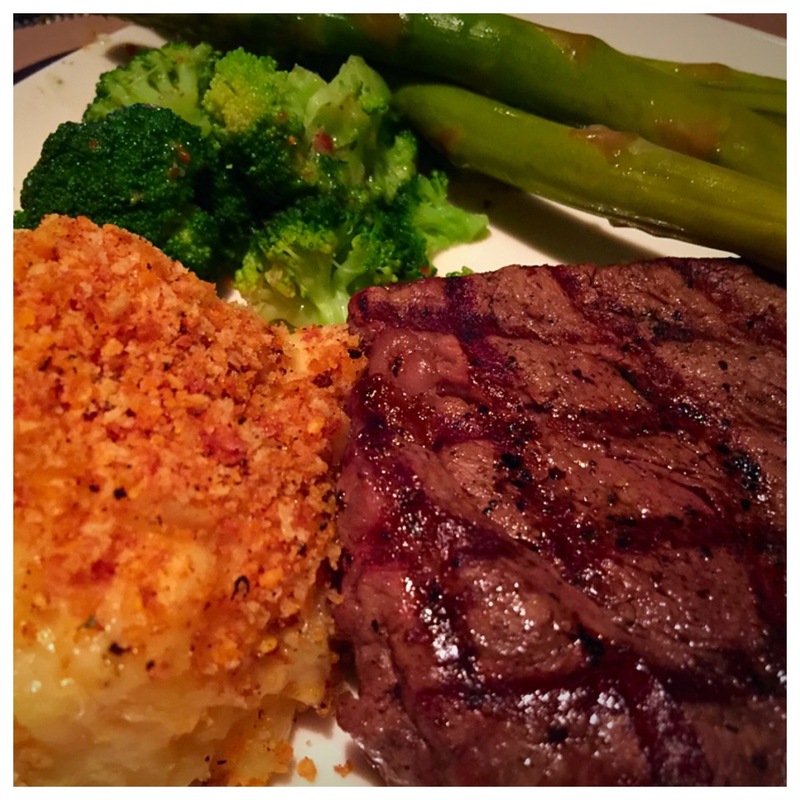 He chose the au gratin potatoes and steamed broccoli to go along with his dinner. When his plate was accidentally delivered with the mixed vegetables rather than broccoli, the staff was super nice and more than happy to make the correction. I had plenty of asparagus on my plate to share, so Scott had some asparagus, too. Doesn't the plate look so healthy with all that green? I know you are thinking by this point that we have had plenty of food, but with the Hooked on Tuesday menu, we still had dessert to tackle. 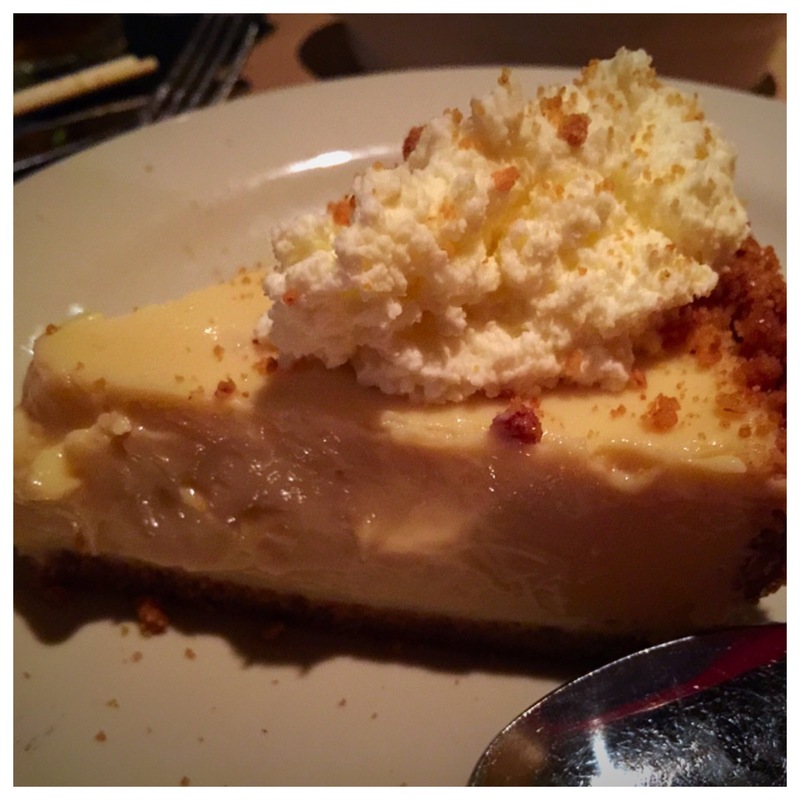 There were three choices on the menu: Macadamia Nut Brownie, Classic Cheesecake and Jen's Jamaican Coconut Pie. 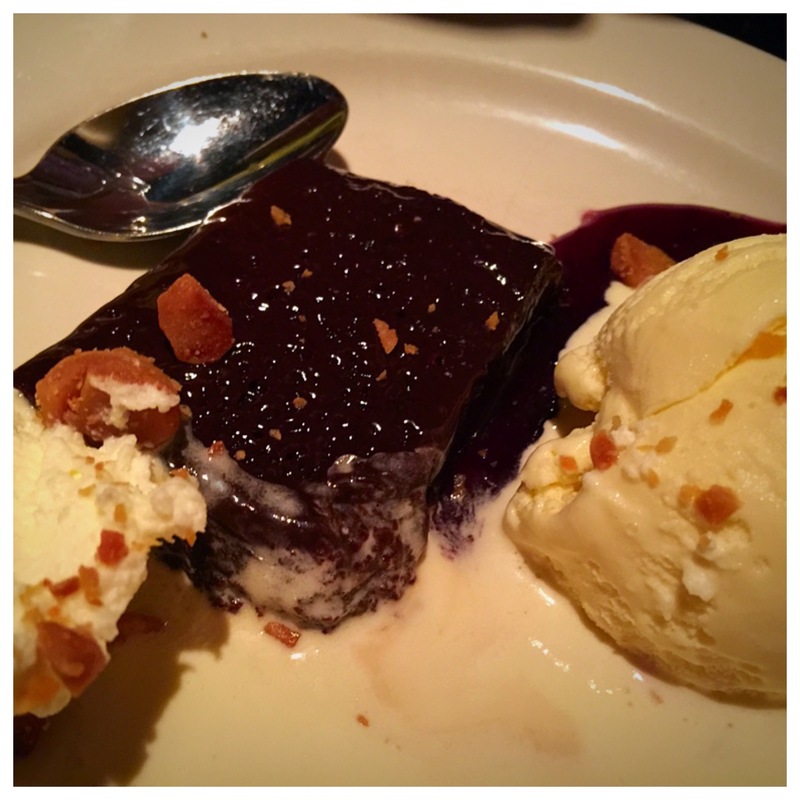 Scott and Rob chose the brownie, which was served with creamy vanilla ice cream and fluffy sweet whipping cream, sitting in a puddle of raspberry sauce and brilliantly topped with toasted macadamias. Yummy! JD and I had decided to get Jen's Jamaican Coconut Pie, but apparently this was a super popular choice, because it was all gone by the time we got to dessert. The manager came out to apologize and offer to replace our dessert with any of the dessert items on the regular menu. 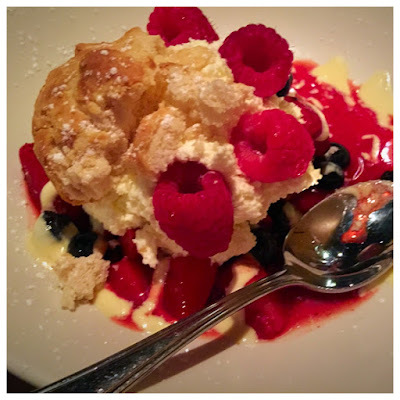 JD ended up with a key lime pie, tart and creamy with a roasted pecan crust, and I chose a Summer Berry Shortcake. My shortcake was a sweet biscuit, piled high with whipping cream, blueberries, strawberries, blackberries and raspberries and drizzled with crème anglaise. It was gorgeous and I loved all the berries. I still want to go back and try that coconut pie! 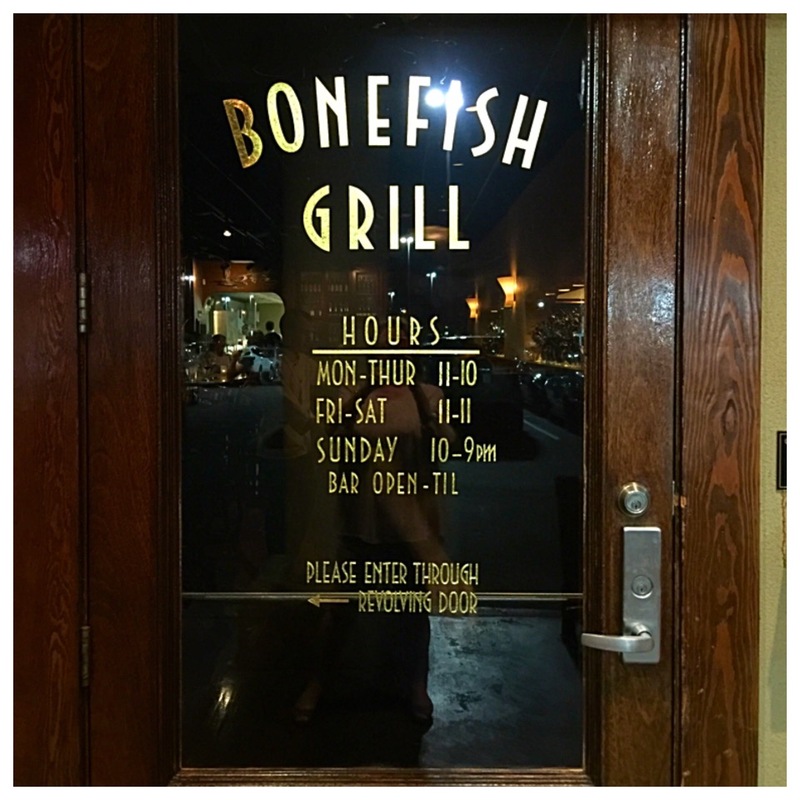 Bonefish Grill's Hooked on Tuesday menu is flexible, delicious and, if the crowd we saw is any indication, working. It is a great value for the amount of food you get. We enjoyed all three of our generous courses and everyone of us left full and happy. 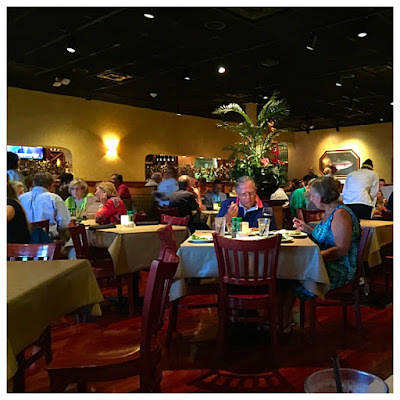 Our server and the rest of the staff at the Huntsville location, with their helpful suggestions and willingness to make accommodations and substitutions, made the tasty food even more enjoyable. 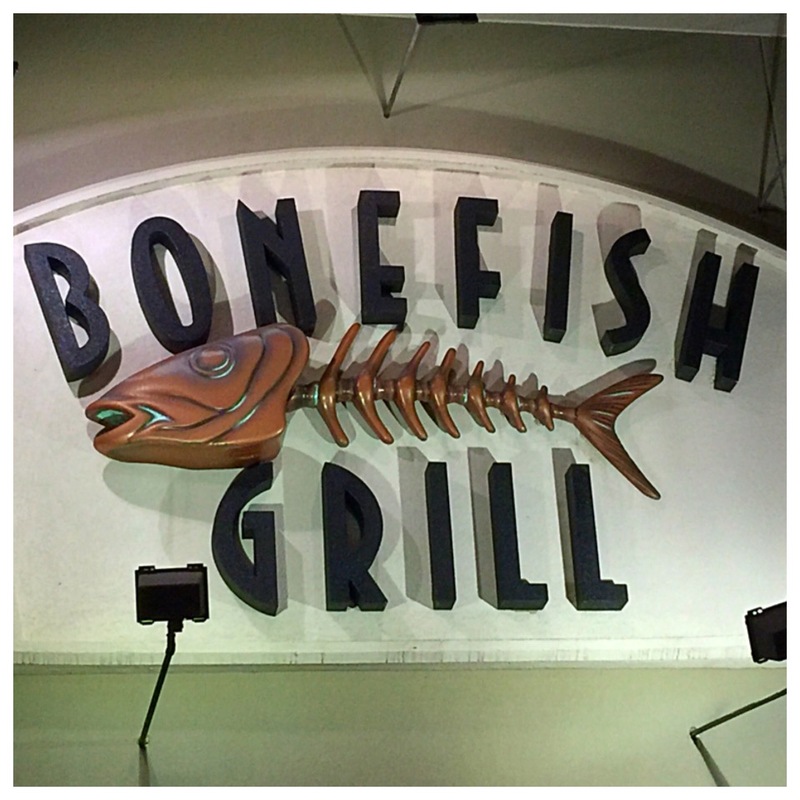 You should definitely swim on over to Bonefish Grill and check out the Hooked on Tuesday menu. I bet you will be hooked, too! 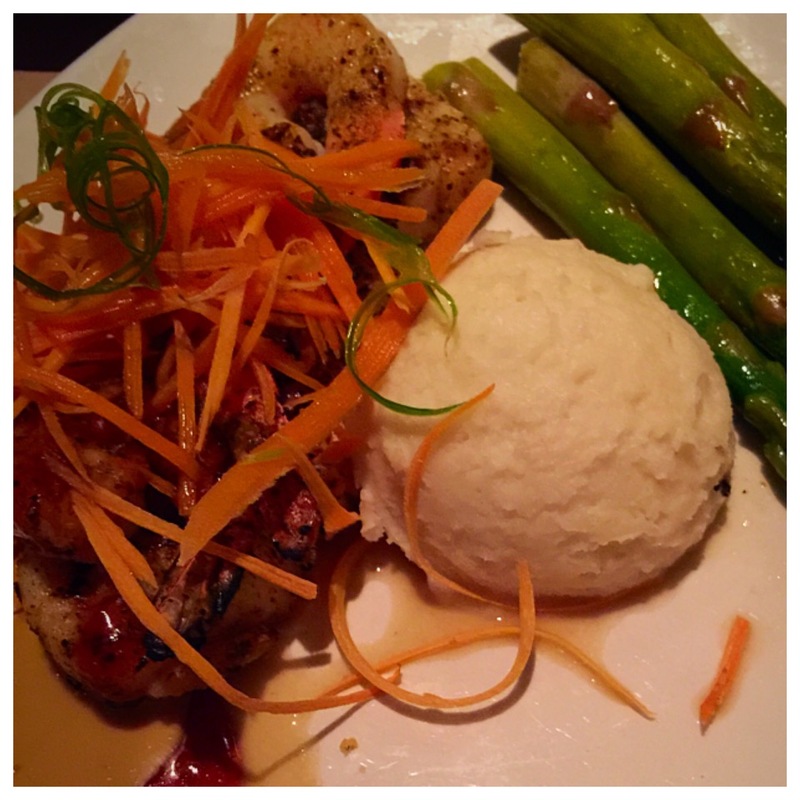 Three Friends and a Fork are Hooked On this new Tuesday Menu and happily give Bonefish Grill 3 Stuffed Yums UP!